Ginger mulled wine is an easy, warmly-spiced drink that will fill your kitchen with a wondrous aroma. This cozy, semi-homemade version features a spice shortcut with a kick from fresh ginger. If the hot summer temps mean we get to have sangria, this time of year must be calling for sangria’s antithesis – mulled wine. For one, the smell. 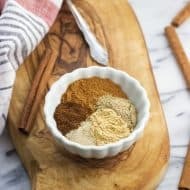 With warm mulling spices like cinnamon, cloves, and allspice simmering away along with wine and/or apple cider on the stovetop, there’s no way your kitchen isn’t smelling good! It’s an easy drink to keep warmed on the stove to serve your guests, and instantly turns even an impromptu hang-out sesh into a cozy and inviting get-together. 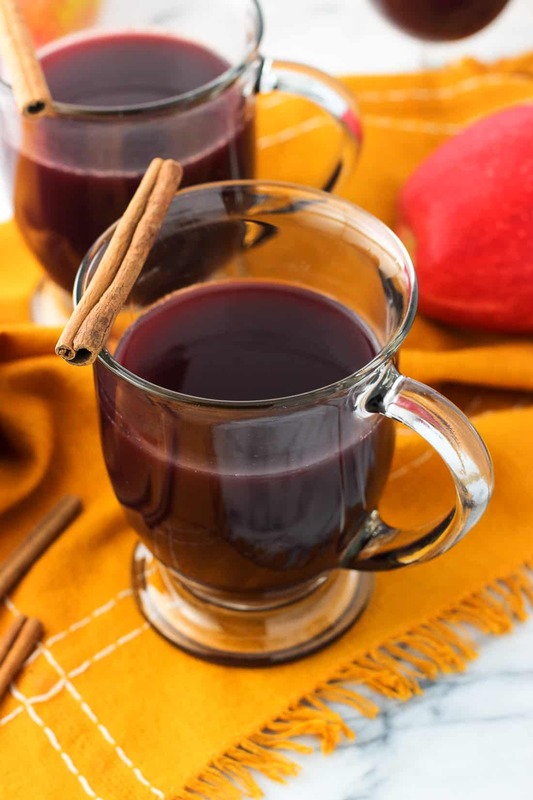 Mulled wine…a fall and wintertime entertaining MVP. 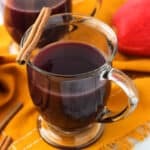 This ginger mulled wine recipe includes a quick spice shortcut along with some fresh flavor love for a semi-homemade recipe that can easily be customized to your liking. The base mixture here is equal parts red wine and apple cider, so it’s a bit lower in alcohol than some varieties out there that are more wine-heavy or also include liquor like brandy. My favorite red is cabernet sauvignon, so that’s what I used here and highly recommend. Since apple cider is sweet on its own, I suggest using a red that’s on the drier side or with a medium dryness like merlot, malbec, or shiraz. There are plenty of recipes for mulled wine and mulled cider out there that call on you to create our own spice bundles, but I opted to stick with a few tablespoons from a store-bought mulling spice packet for this ginger mulled wine and I’ll tell you why. Mulled wine only makes its appearance sparingly throughout the season when I’m entertaining, so the thought of buying jars of cardamom pods, star anise, and whole cloves/nutmeg/allspice (aka spend some $$!) on top of apple cider and wine wasn’t the most appealing to me. I found a packet of mulling spices in my regular grocery store for just a few dollars and with using two or so tablespoons at a time, it will be more than enough to last all mulled wine/cider season long. This time – perfection! 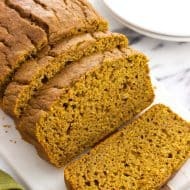 You can definitely feel a bite from the ginger, but it’s not crazy overpowering. That said, I do suggest this recipe to those who indeed like ginger – I know I certainly do. 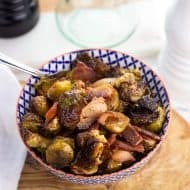 It adds a warming kick to a traditionally-spiced mulled wine recipe that will no doubt be welcome once the temps dip down. Stir together all ingredients in a saucepan. Heat on low/medium heat until mixture is bubbling. Once bubbling, let simmer for at least a half hour, or longer. Strain before serving. 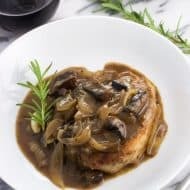 If after simmering you find the ginger flavor to be too strong, you can add equal quantities of wine and cider and heat to slightly dilute. That said if you're not sure on how you'll feel about ginger's bite here, I suggest starting with a smaller quantity of grated ginger and tasting throughout to see if you'd like to add more. Mulled wine and mulled cider are my favourite things about winter, love that this has both in! The freshly grated ginger addition sounds great too! 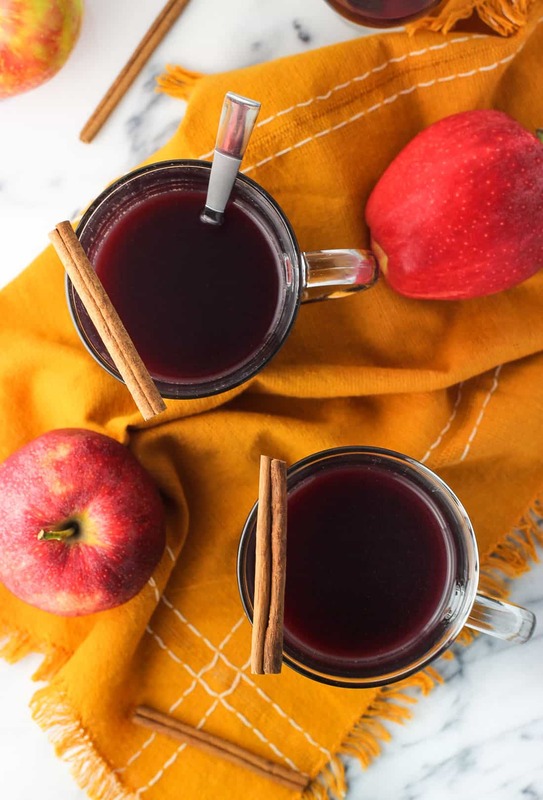 I still have yet to try mulled wine but this seriously looks SO amazing, Alyssa! I think I need to make this for our next fam get-together! Thanks Sarah! It’s definitely a crowd pleaser! I can just imagine how AMAZING this made your house smell! 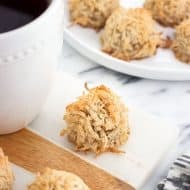 I love all these cozy fall flavors and would love to curl up with a mug! Oh this looks SO good! I can just imagine sipping on a big mug of this in front of the fire on a snowy night! Thanks Ashley! I certainly don’t want to rush the cold weather, but that scenario sounds wonderful! Okay this is going to sound nuts but I only had mulled cider for the first time last year! And the smell alone! So good! This mulled wine sounds wonderful!